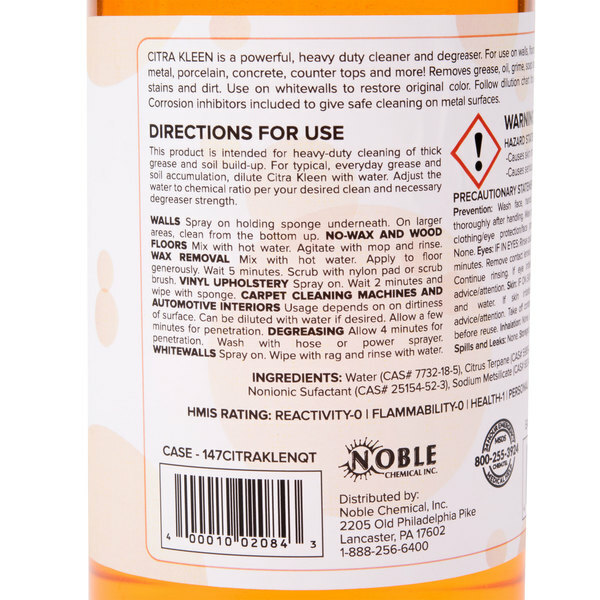 Keep your commercial kitchen or bathroom clean with Noble Chemical's CitraKleen all-purpose citrus cleaner and degreaser. 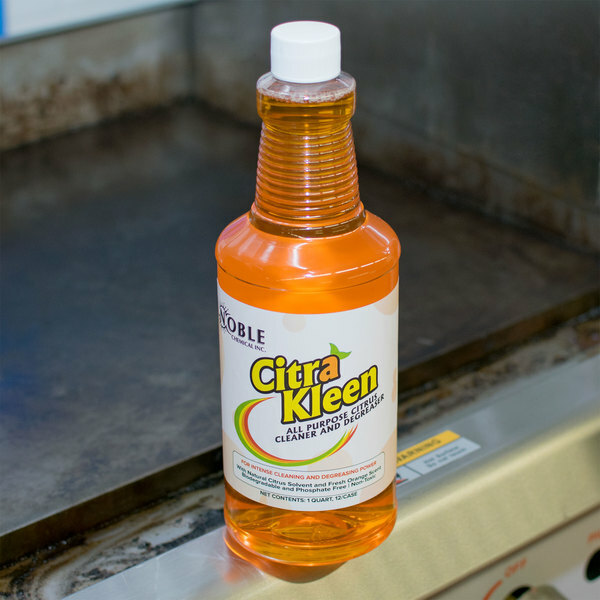 Noble Chemical's CitraKleen all-purpose citrus cleaner and degreaser is perfect for cleaning all of the hard surfaces in your business's kitchen and restrooms. This heavy-duty solution can remove even the toughest grease, dirt, and mineral buildups and leaves behind a pleasant orange scent. You can use CitraKleen on tile, porcelain, stainless steel, chrome, and a variety of other hard surfaces, making it a perfect choice for any facility. "Awesome product! We use this to clean out 3 basin sinks- you'd be surprised how gross they get with grease buildup. A squirt and some elbow grease cleans it up!" 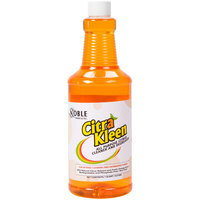 To use CitraKleen, spray or mop the solution on the surface you want to clean. Allow concentrate to remain on the affected surface for several seconds, then wipe off with a damp cloth. 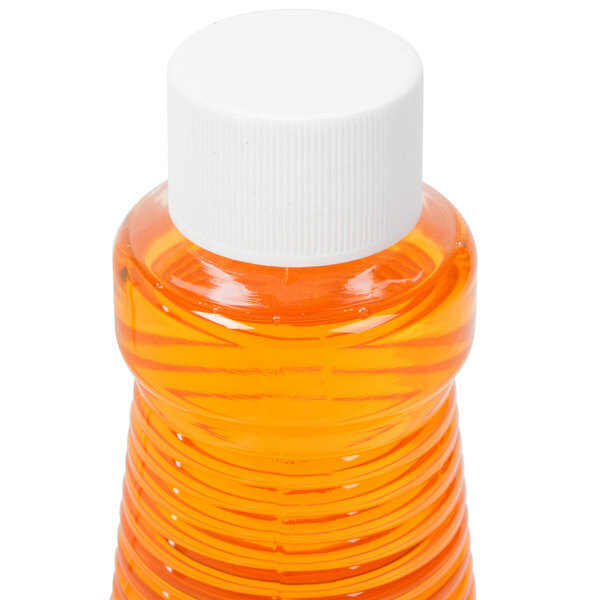 This bottle also includes clear step-by-step instructions printed on the label. This bottle's easy-to-grip neck fits perfectly in your hand, and the small mouth allows you to dispense the exact amount of cleaner you need. CitraKleen all-purpose cleaner is made of natural citrus ingredients, making it an environmentally-friendly choice for any business. With a refreshing orange scent, this formula is a natural citrus solvent that is perfect for cleaning and removing grease from multiple surfaces. Noble Chemical brand supplies are a smart addition to any restaurant, hotel, or healthcare facility, and this handy cleaner will keep all of your hard surfaces clean. Be sure to check out our quantity discounts for even better wholesale savings! This cleaner is very powerful with a nice scent! I will definitely be sure to keep this in stock, therefore I will be ordering more soon! This cleaner works really well for all of our surfaces, cleans our sinks well, and smells great. I'm not sure if a spray trigger was a suggested item, but if not, that would be easier to order together next time. I can't tell you how impressed I am with this all purpose cleaner and degreaser! It is not only amazingly effective but leaves a nice, light smell behind. Some cleaners can be too heavy, but with this one, a little surely goes a long way! I am definitely buying more of this! Really glad I found this! I hardly ever need to use degreaser, but when I do its really nice to have on hand. So I didn't want to have to buy a whole gallon that I'll never use, and This is a perfect size bottle for people that want to have degreaser on hand just in case, but dont need it on a daily basis. Works very well too, and leaves a very pleasant orange scent. This is one powerful cleaner! It works great for cleaning up heavy grease spills and it smells great. It can be used for cleaning counters and floors. A little bit goes a long way. This is a really good cleaner. The only issue that we have had with the product is that almost always have to dilute it. If you do not it tends to be too strong for normal applications. I guess that it probably a good thing though. We used to use the name brand yellow cleaner in gallon containers but I totally prefer this now. it smells wonderful and cleans great. I would even use this in my house. 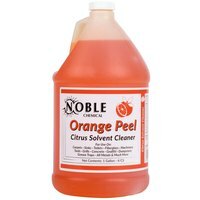 I purchased Noble All Purpose Citrus Cleaner and Degreaser for personal use. I absolutely love this product! I used it to clean my kitchen and it left a wonderful clean scent. I would definitely purchase again! Great product, we use it for our heavy duty chicken ovens where grease really gets sticky. We wanted a safer solution to clean our ovens, we found it with this, we have ordered it many times and every time it leaves them looking amazing. 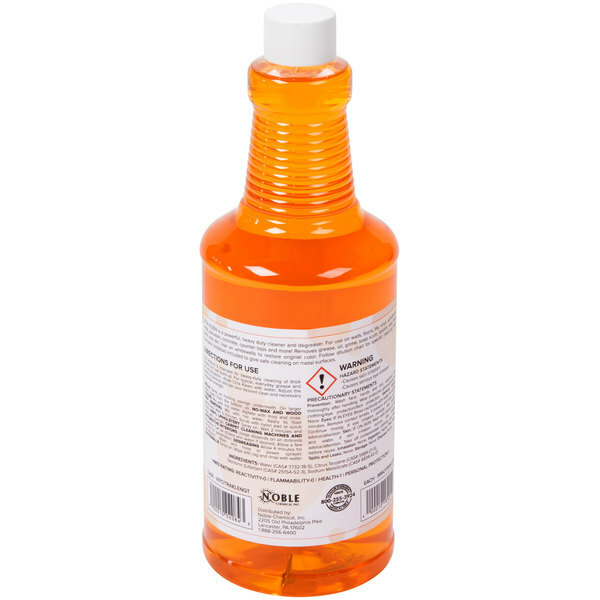 This citrus (orange) cleaner works great as an all purpose cleaner. I use it all over the kitchen, and it does a great job at almost any cleaning task. 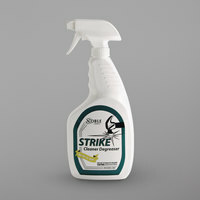 For general cleanup I just spray and wipe, for heavier duty jobs let the cleaner sit for 30 seconds or so to penetrate. I also love the orange scent that it leaves, it is a great "clean" smell. This cleaner smells really good, a clean orange citrus scent. It works okay, I don't know if it would really power through lots of tough grease though. Dish soap would probably be better for that. I thought it would be like a knock off of goo gone, but it's a completely different type of product, doesn't do much for dissolving sticky labels. This cleaner is amazing. Non toxic, smells awesome and cleans the toughest dirt without the hard scrubbing. We use it on floors, walls, tabletop, chair legs... You can download a packet that suggests dilution based on what you are cleaning. Great product. However, does not include the spray nozzles. So be sure to order some of them. Perfect cleaner for perfect price! You will absolutely love this one! It is really strong and it has such a nice nice smell! Great for any household or professional use! Good all purpose, eco friendly degreaser. Normally this stuff is really gnarly, but this cleaner is nice smelling and effective at most jobs we need. 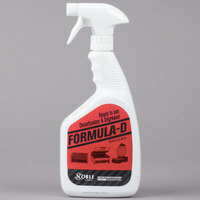 This cleaner and degreaser is really a great product. Any time I have a difficult stain on a pot I pour some of this with hot water and let sit for an hour. Pot looks as good as new after! Works great. Can be diluted but at full strength this will clean anything. We used it to clean and old greasy vent hood with no problems. Smells awesome. Wife wants some for our house. 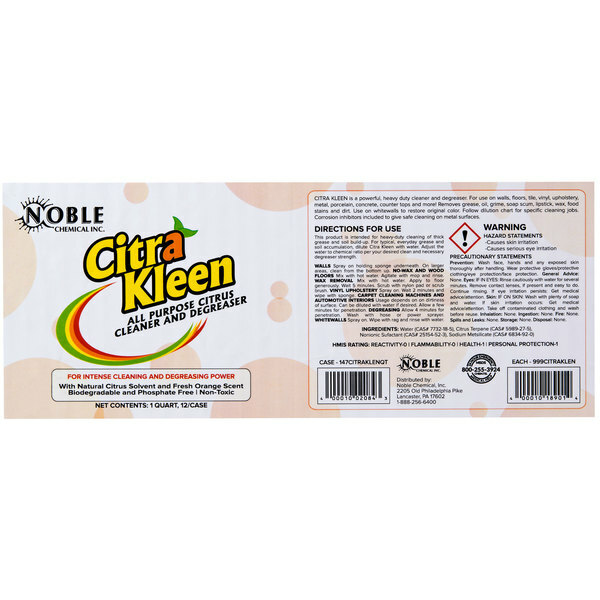 Gdreat Noble Citra Kleen cleaner. has a nice Citrus small and does a great job cleaning our dishes. The 1 qt bottle was offered at a nice price. You can't beat the smell of this product, it is by far my favorite. Normally degreaser don't have the most pleasant smell, this is such a refreshing scent. this product smells as good as it works! my employees like that it does not smell like a harsh cleaning agent ( it smells like oranges) , and it cleans better than most of the cleaners we were purchasing from elsewhere. Awesome product! We use this to clean out 3 basin sinks- you'd be surprised how gross they get with grease buildup. A squirt and some elbow grease cleans it up! I go through alot of this. It is great for cleaning walls. Takes off any greasy film and makes everything smell so clean and fresh.